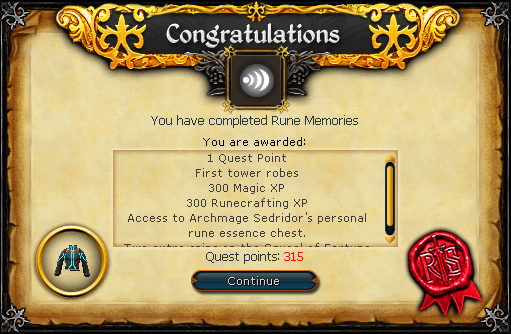 Rune Memories is a quest in RuneScape which is only available to Members. It was released on 28 November 2012 as a sequel to the Rune Mysteries quest, which also received a complete rework on the same date. 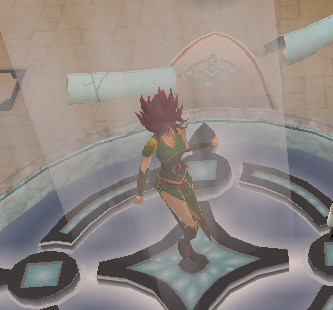 The quest features Ariane, one of the seven Signature Heroes of RuneScape. Speak to Ariane in the spellcasting chamber of the old Wizards' Tower. This is a fully voiced quest, so you may want to put your speakers on! You can start this quest by speaking to Ariane in the old Wizard's Tower, which is located beneath the current Wizards' Tower. Ariane states that she wants to cast a spell on the source of the power beam so she can figure out who removed the enchantment and released the vortices into the Wizard's Tower as seen in Rune Mysteries. She asks you to stick around in case something goes wrong. Tell her you'd be happy to help (you must have 14 free inventory spaces to agree to help) and Ariane will cast the spell. Unfortunately Ariane has miscast the spell. She is stuck in the vortex and unable to move. Ask how you can get her out and she will tell you to disrupt the source of the power beam by recreating the ritual that created the power beam. This would disrupt the beam and release her. She will give you a prepared fire and air rune and tell you to use each rune on a vortex. 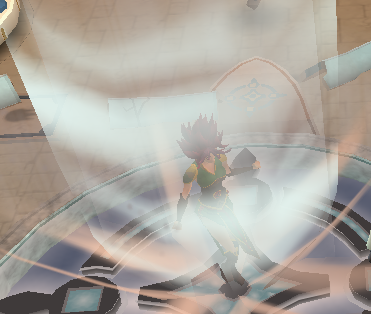 Use the fire rune on a red vortex and the air rune on a grey vortex. The procedure will work. Ariane tells you that each rune is the remnant of a wizard who once lived in the tower. She will tell you to go over to the library to investigate more. Head east to the library door and open it. You should find yourself in the old Wizards' Tower library. Head east to the table surrounded by four chairs. 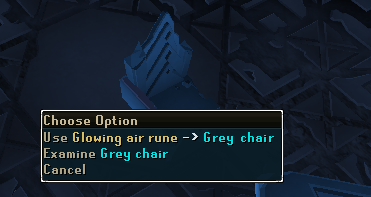 Place the fire rune on the red chair and the air rune on the grey chair. 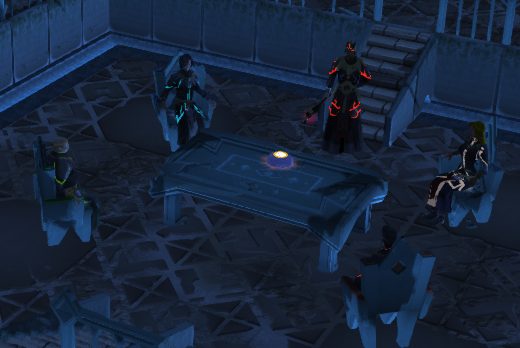 If you have trouble figuring out which chair is which color in the dark you can right click the chairs. Doing this will result in the summoning of two wizards, Mei the Grey and Kelavan the Red, who appear to be having a conversation. Kelavan the Red is talking about how he is trying to create offensive spells that bypass defensive ones. Kelavan states he is having trouble and shows Mei the work. Mei looks at the work and thinks Kelavan might have accidentally stumbled upon something. They both agree to show a superior and the memory ends. The fire and air rune will return to your inventory. Report back to Ariane and tell her you saw two wizards discuss the "teleportation problem." She will be pleased with the progress and give you several more runes. Use the earth and nature runes with green vortexes, the water and law runes with the blue vortexes, the cosmic rune with the grey vortex, and the chaos rune with the red vortex. 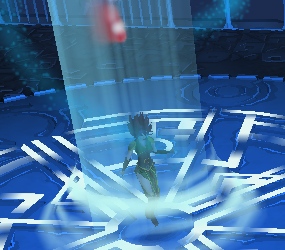 When you have finished every rune you have should be glowing and all vortexes should be gone. After this talk to Ariane and she will tell you to head up the staircase and use each rune with a statue. Head west, go up the staircase, cross over the fallen statue and head into the room with the Rune Guardian. You should see four statues in the center of the room. As usual, you will need to put a specific rune with a specific statue. Unlike previously, however, you will have to put the runes based on what god their colors are associated with. You should see a god symbol (or in one case no symbol) at the base of the statue. 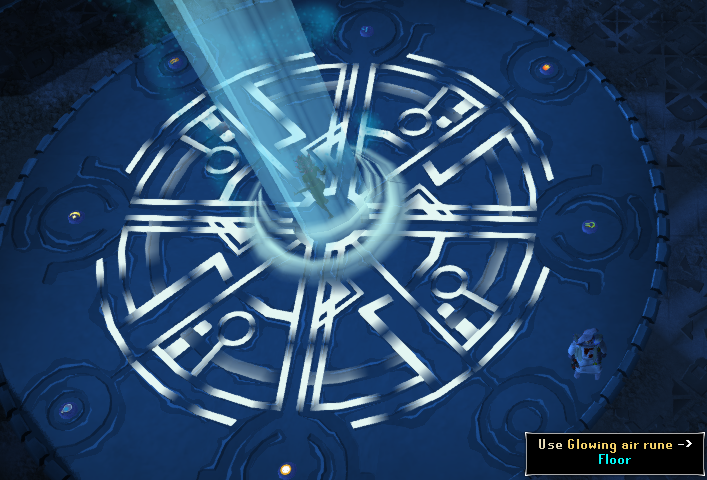 Use the nature rune with the Guthix statue, the law rune with the Saradomin statue, the chaos rune with the Zamorak statue, and the cosmic rune with the statue with no god symbol. After doing this two wizards, Temrin the Grey and Zanmaron the Red, will appear. The two will have a short conversation before another wizard, Unaia the Blue, appears. Following her, Azris the Green will appear to make an announcement. 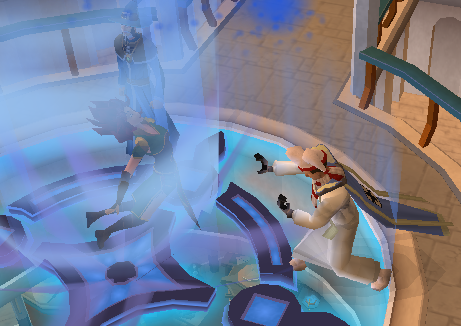 She presents a document that contains the framework for a spell that teleports people to the Rune Essence mine. The other wizards are thrilled and agree that it will work. Azris asks each wizard for help in the ritual as all four orders of wizards are required to commence the ritual. However, when asked who's work this was, she will claim credit instead of giving it to Mei the Gray and Kelavan the Red. The four wizards agree to reconvene at a later time and the memory ends. Head back to Ariane and tell her what you saw. She will be shocked to hear that a head wizard would steal an idea. She tells you to recreate another memory. Head north, go through the studies door, and walk to the northeastern most room. Place the chaos rune on the large chair and the fire rune on any of the small chairs. You will see another memory. Zanmaron will confront Kelavan and ask why he took the teleportation idea to Azris and not him. Kelavan will reply that Azris is the expert on teleportation. Zanmaron will be mad that he did not see it first and alert Kelavan that Azris is claiming his idea as her own. Zanmaron also states that he will do nothing to get Kelavan recognized for his accomplishment. Kelavan will be dismissed and Zanmaron will summon a lesser demon who is the keeper of the abyss. The memory will then quickly vanish. Once again head back to Ariane and report what you saw. She will say that having the keeper of the abyss makes sense because all teleports must use a second plane (in this case the abyss) as a hub before bringing the teleporter to the destination. She then asks you to create one final memory to find out how the connection with the abyss was made. Head west through the library door again to enter the library. Place the air rune on the grey chair, the fire rune on the red chair, the earth rune on the green chair, the water rune on the blue chair, and the chaos rune on the table. This will create another cutscene with the four apprentices and Zanmaron the Red. The apprentices begin debating the morals of teleportation. Zanmaron will then announce that they are almost ready to begin the ritual. He says eight wizards are needed and will hand out instructions to all of the apprentices. After the memory ends head back to Ariane to tell her what you saw. She says that the ritual would have occurred in the room you two are in right now. Before you create a memory, however, you will need to find out where each wizard stood. Head to the library and search the shelves to find two document fragments. Now head to the studies area and search the crates and chests to find the remaining fragments. There should be one fragment in each room. You should also find an evil diary in the red room where a wizard talks about destroying the tower. 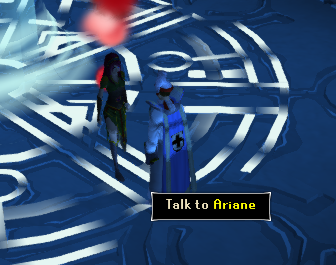 Talk to Ariane and then place the runes where they belong around the beam. There are a couple of ground rules for this. 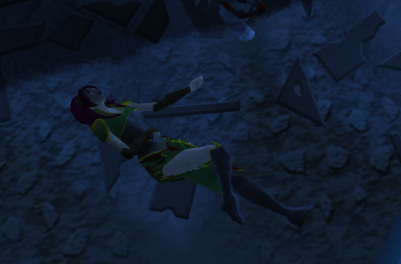 Saradomin runes must be opposite of Zamorak runes, vice versa. Two high level runes or two elemental runes cannot be placed next to one another. Two runes of the same color cannot be placed next to one another. The earth rune must be placed at the left of the cosmic rune and the right of the law rune. 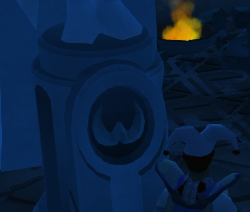 The chaos rune must be located in the southernmost point of the circle. The strategy will work and Ariane will be freed from the beam. Then the memory will begin. The wizards will begin the ritual. Everything goes fine until the blue apprentice notices a demon behind Zanmaron the Red. It is explained that the demon is there because the ritual uses demonic power. The wizard refuses to go on with the ritual because of its uses of demonic power. Later Mei gets into an argument with Azris over who came up with the idea, with Azris admitting that she did not come up with the idea. 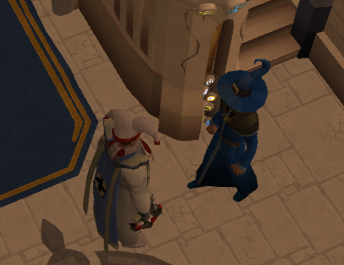 Despite Zanmaron's best efforts to keep the ritual going, the two blue wizards leave halfway through the ritual. This causes the ritual to become uncontained and evidently destroy the tower. Strangely the force from uncontained ritual reappears and hurts Ariane. Investigate Ariane and you will discover she is in some sort of magical coma. Now it is time to get help (or you could leave her there for a while if you are feeling a little sinister). 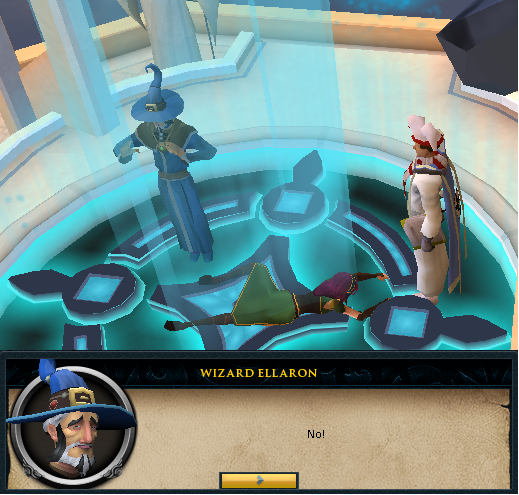 Return to the surface and talk to Wizard Ellaron, who should be near the entrance of the Wizards' Tower. Tell Ellaron that Ariane has been hurt. Oddly, he will know that she is in a coma even if you didn't tell him that she was. It turns out that Ellaron has planned this and that he is the author of the diary. He has used his former apprentice, Ariane, to figure out how to conduct the ritual so he could use it to destroy the tower. According to him the red wizards were blamed for the destruction of the first tower by the blue wizards and shunned from the new tower. Now he is trying to get revenge. IPick the fight option and he will tell you it is too late and begin the destruction process. Ariane, who is now conscious, will ask what is happening and Ellaron will inform her of his plans and notify her that she will soon be torn to pieces. Talk to Ariane after that confrontation and she will be possessed by Temrin the Grey. Temrin will suggest you take out each personality fragment before the beam goes out of control. When the beam is red use a chaos or fire rune, when the beam is grey use a cosmic or air rune, etc. Besides color, there are more distinctions between the beams. There are two types of beams which indicate whether the soul trapped is an apprentice or a master. A simple beam indicates an apprentice. A beam with a vortex at the bottom indicates a master. The beams change quickly so don't fall asleep on the job. First you will need to use the cosmic rune on Ariane when the beam is correct (the above picture indicates the beam used with the cosmic rune) and you will take a soul out. Next up is the water rune which goes with a simple blue beam. Following this Ariane will ascend to the next floor. Follow her up there. 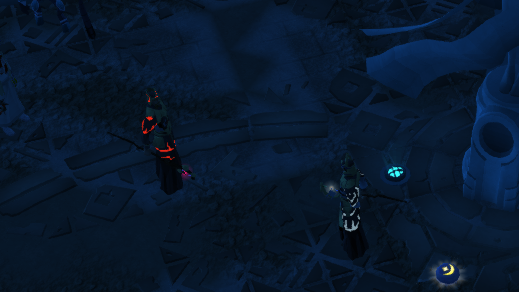 Next use the earth rune on the simple green beam. Following that is the fire rune and the simple red beam. Ariane will ascend again and you will need to follow her. Use the law rune on the vortex beam and then the nature rune on the vortex green beam. 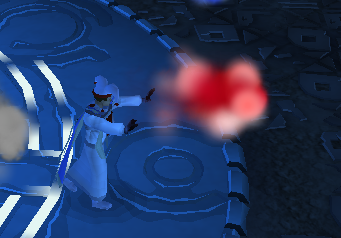 Ascend with Ariane again and use the chaos rune with the vortex red beam. Finally pull Mei the Grey out by using the air rune with the constant grey beam. After you extract the souls from Ariane they will find a new host: Wizard Ellaron. The wizards will teleport Ellaron to the abyss, leaving you and Ariane alone. Talk to her and tell her about how you found out about the old Wizards' Tower. She will agree that you two did well and teleport out. Now you will finish the quest. 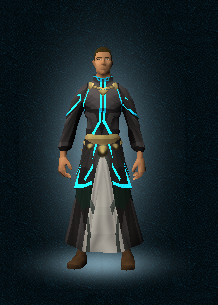 The First Tower Robes are low level magic robes. 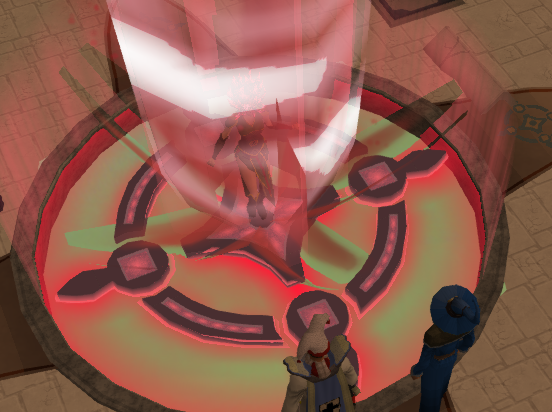 Their colors can be changed by switching your allegiance with the Rune Guardian in the old Wizards' Tower. 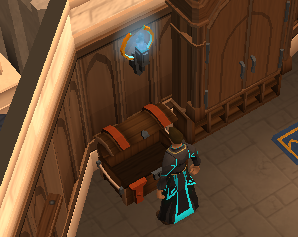 This chest is located in Sedridor's room on the second floor and contains pure essence free for your taking. Each time you advance a level in runecrafting more essence will be available in the chest. The amount of essence available at first depends on your runecrafting level. The amount of essence available to high level runecrafters is in the tens of thousands. 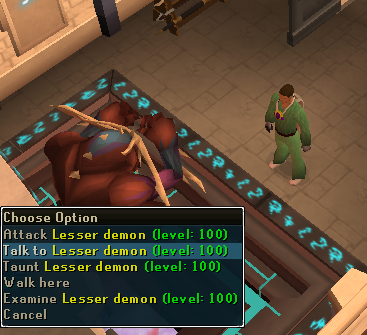 After the quest you can talk to the Lesser Demon on the first floor/second story. This is the same demon summoned in the ritual. Talk to him and he will give you an offer: give him a drop of blood and gain 10,000 magic experience or vow not to deal with the demon and gain 10,000 prayer experience. You need level 50 in each skill to gain experience.